Quality boutique gin is sweeping the states, so it makes sense that France’s famous micro-distiller (Gabriel Boudier of Dijon) has given us an artisanal Saffron Infused Gin. The gin is based on an old French colonial recipe, centered around the spices of India, and handcrafted in small batches that utilize an old pot still method. The first thing you notice is the golden orange color. I’d imagine they’d like you to think that comes from the saffron infusion, however after further inspection you’ll notice that the ingredients include certified color and FD&C Yellow #5. This is a bummer, but I powered through it as I’m on a mission to try all gins known to man. But yeah, negative points for that one, Gab. The upfront smell is of juniper, naturally. The sip test revealed a spicy saffron and almost a sweet honey taste. You’ll also notice a hint of fennel, coriander and orange peel. It’s definitely a drier gin. Very crisp and clean. Officially the botanical heavy recipe includes saffron, juniper, coriander, lemon, orange peel, angelica seeds, iris and fennel. So maybe I was a bit hard on this gin. It’s pleasant and I think the color could be leveraged nicely in some presentations. You can definitely taste the saffron, which gives it a very unique taste. Sells for around $30 a bottle. Note: Gabrial Boudier of Dijon also makes a fantastic creme de cassis. Thank you for your kind review of Gabriel Boudier Saffron Infused Gin. To clarify one comment in your review regarding the use of a coloring agent. We would like to bring some comments on this article, regarding coloring agents. The color is indeed coming from the saffron Infusion. The reason why we use coloring agents is to get exactly the same color from one batch to another one. The color of saffron changes a little bit depending on the crops. In order to get always the same orange color we use these coloring agents, but this is not always the case. Sometimes we do not have to add some. Thank you for clarifying. I appreciate your comments. If you are catering to the small batch customer, I wonder if this segment would prefer an unadulterated liquor with inconsistent coloring over the the usage of dyes and coloring. Was there any sort of marketing research done on this? If so, I’d love to hear about the results. I realize this post for Saffron infused gin is older, but wondering if you have any suggestions for creations utilizing this spirit? We recently had a gin & tonic party, our guests each brought a different variety of gin, and we put them to a blind taste taste. Some friends found this and thought it would be unique. It was unanimously disliked, finishing at or near the bottom of everyone’s critique. So g&t’s may not be it’s strongpoint, but I’m sure there are other ways it could be utilized. Our friends left the bottle behind (they claim accidentally Anyhow, when we see them again in a month or so I want to turn this into something we can all enjoy! Do you have any suggestions? Thanks! Nate, I too dislike this in a gin and tonic. Favorties at the moment for reference would be no 209, Hendricks, and Plymouth. This does however work wonderfully in a Negroni. It also made an interesting Gimlet. I bought this gin a while back in hopes of an interesting adventure. I started simply with a gin & tonic, opting to stay away from a lime twist and instead using lemon. I didn’t mind it, but there was something lackluster about the drink overall. I just now looked through the cocktail recipes on the Gabrial Boudier of Dijon website. I’d love to try this spirit with either raspberry, coconut milk, and/or ginger. It would be lovely if you had any suggestions. My favorite Gin after trying many is Old Raj; I think because of the saffron. I went to buying the G Boudier and mixed it with other for gins for a while. I now buy saffron and throw a few sprigs in the bottles of gin I buy. I think Saffron is a great addition, although otherwise I tend to favor just the traditional botanicals. 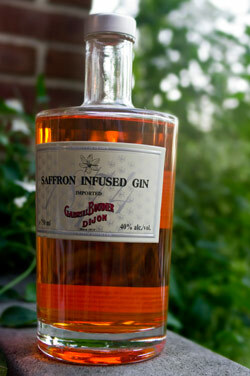 I have several bottles of the GB Saffron Infused Gin. I have misplaced a recipe that I had for a saffron peach martini. made with peach liquor. A mixologist created it in California. If you have please share it anyone?? ?